"Like a lot of kids, I grew up with Lamborghini die-casts and posters of hyper cars," Stephen Sayer tells me. I had asked how he found his love for cars: a question I ask nearly everyone in preparation for their article-to-be. The answers vary, with cliche answers shoe-horned in more often than not. Stories of Porsche posters run rampant, and if anyone's counting, it's the "childhood 911 on the wall" that's to thank for 9 out of 10 car enthusiasts. But instead, Stephen joked. He knew the drill, but continued, "...the real glue for me was my grandparents." Automotive enthusiasm often begins with stories of father-son bonding in the garage, but with Stephen, it seems to have skipped a generation. Despite his father's handiwork as a boat builder, Stephen suggests that his father isn't necessarily a "car guy." Instead, it's his grandfathers - both of them - for which he attributes his love for the automobile. His maternal grandfather purchased a Jaguar E-type when Stephen was born, a car he hoped to drive around with his infant grandson in tow, following a full restoration. Stephen's father's father, on the other hand, is what Stephen refers to as a real old school hot rodder. "Not the glitter paint catalogue resto-mod hot rods, but the kind of hot rod you put together yourself or with close friends," he says. By the time the E-Type was roadworthy, Stephen was old enough to drive it. On the other side of the family, his hot-rodding grandfather had moved on to building airplanes, but both grandfathers had played a helping role in rearing Stephen as a gearhead. In turn, between the Jaguar, the hot rodding, the planes, and his father's boat building, Stephen grew up around an eclectic mix of stuff, which manifests itself in Stephen's own collection today. 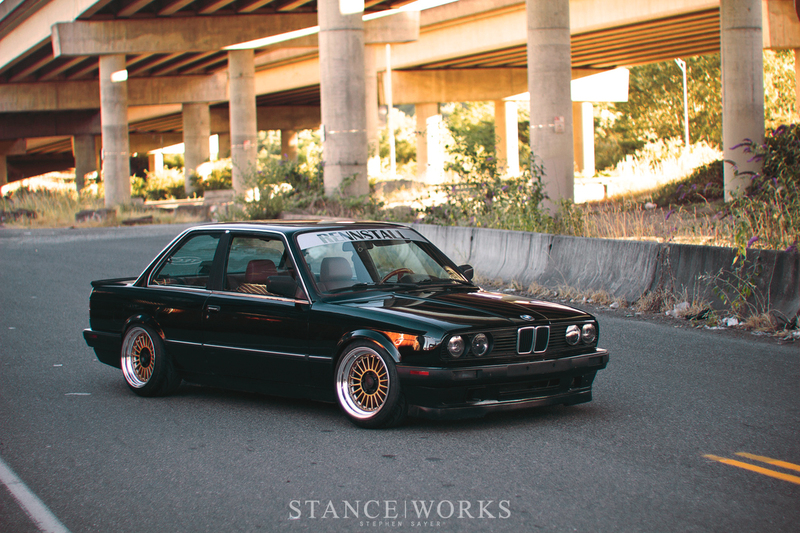 The E30 was his first car, but in the stable along side it sits a Porsche 911, an FJ80 Land Cruiser, an E23 7-series, and a Honda civic, each with their own duties and purposes. As for where Stephen's heart lies, it is a bit hard to nail down, but he's happy to admit that BMWs came as his first love. In the hunt for his first car at 16, it was German steel that had earned his affinity. 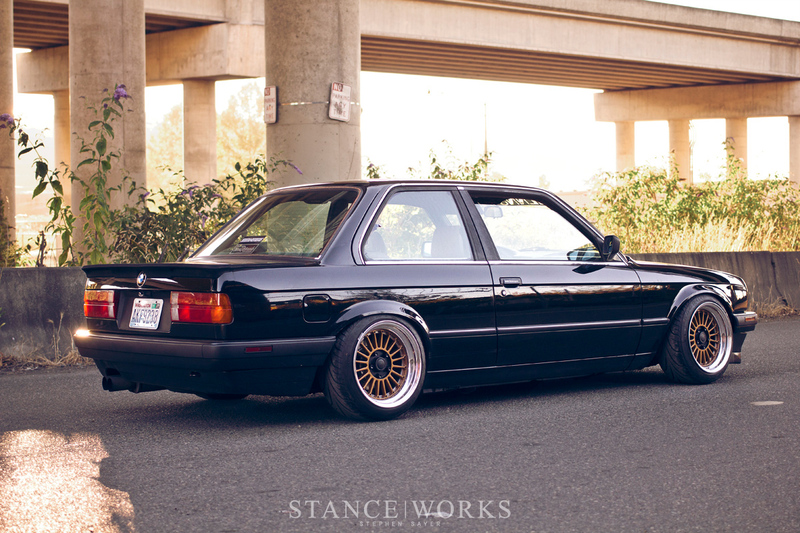 E30s, E36s, and the Volkswagen Corrado all topped his list. E36s proved expensive overall, and Corrados "always seemed to be kind of in shambles in my price range," as he puts it. Whether it was due to price range, or merely the fact that they were Corrados is another story, but in any case, it was the E30 that won out. Before the E30 boom, it wasn't uncommon to find cheap examples, especially those in need of work. The example Stephen stumbled upon fit that exact criteria, giving all the knowledge passed down by his grandfathers an eventual purpose. 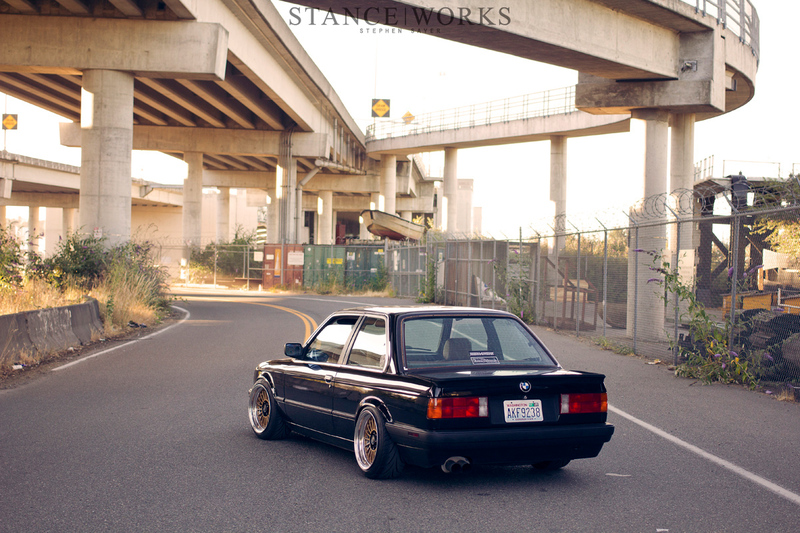 Stephen found his E30 in a charity car lot, donated by the previous owner after they had presumably decided that the 20-year-old BMW ownership club wasn't part of their agenda. Perhaps it hadn't been for quite some time, as a thick layer of dirt and dust covered the bodywork. Underneath, the panels were straight and rust free, and hidden behind the bubbling purple window tint was a pristine black interior. It ran and drove, needing little beyond some care and cleaning - perfect for a 16-year-old's budget and entry to the world of BMW ownership. In the 9 years since, the car has received varying levels of attention, as Stephen's interest shift from one car to another. In the early years, Stephen tackled a bumper swap, finding the factory "diving board" aluminum bumpers to be ungainly. Stephen took the steps to do the swap properly by sectioning a late-model rear valence to his car, followed by plastic bumpers front and rear. A mild drop at the time started his suspension's momentum towards terra firma. Another big step in the car's history was the stroker motor build; the factory M20 "e" motor left a lot to be desired. 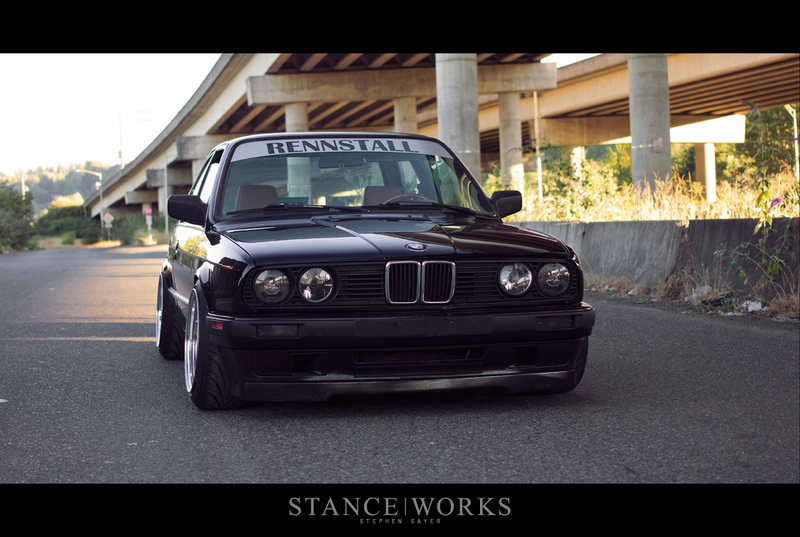 By pairing the "e" block with a 325i head, along with 19lb injectors, a tune, and a full exhaust, Stephen was able to net some notable power gains in the E30 compared to stock. The suspension received another round of changes - this time in the form of shortened strut housings, W124 Bilsteins, and taller rear shock mounts, all helping to adjust suspension lengths for improved travel and ride quality. 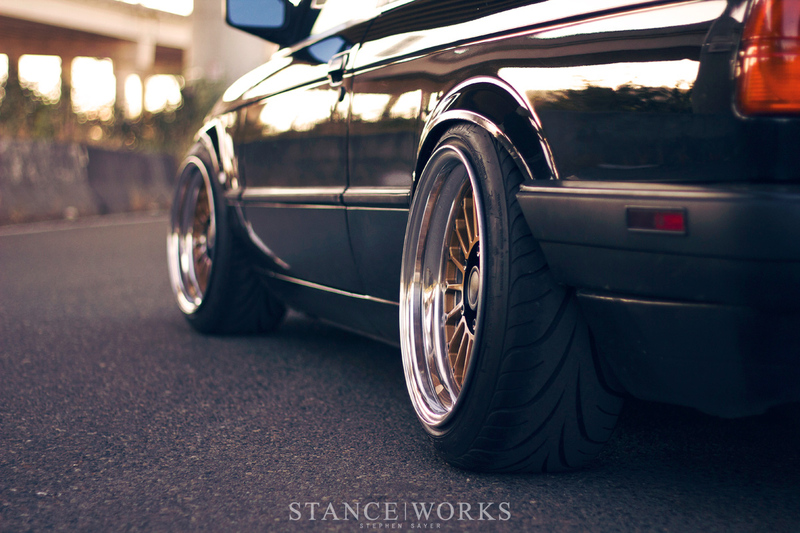 Poly bushings can be found under the car, as well as AKG adjustable swaybar links, and camber plates for fine-tuning. For aesthetics, Stephen kept things reserved in nature. After the bumper swap, the most notable change is the addition of smoked smiley headlamps and the Kamei rear spoiler. 16x9 Weds Bavarias, refinished in gold, black, and polished halves, finish out the styling, blending in an aftermarket Alpina aesthetic to the exterior. Inside, an E30 M3 interior was fitted, and dyed "brick red" to contrast with the deep blacks found elsewhere inside. 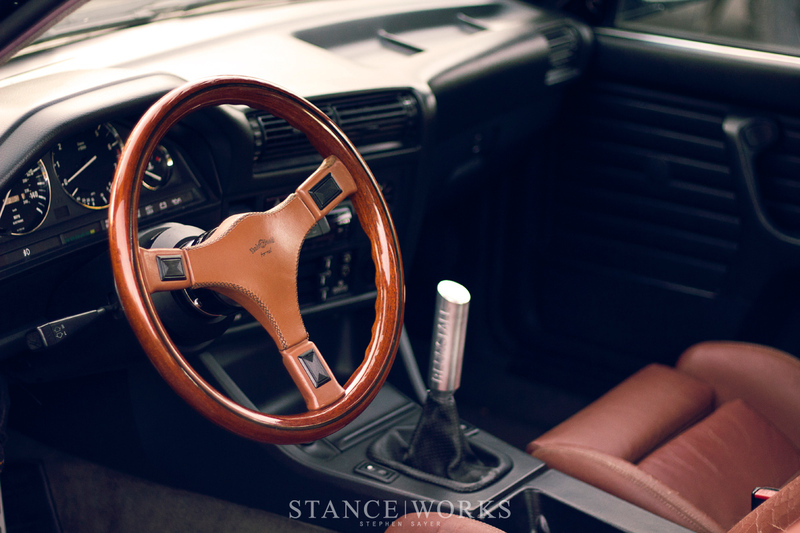 An Italvolante wheel and Rennstall shift knob round out the details. The observant may notice wilwood pedals dangling from under the dash: a boosterless setup that hints at what is to come. "Ultimately, it's to make room in the bay for the M60 down the road," Stephen admits. The M20's power clearly isn't enough, and his grandfathers are sure to suggest, there's no replacement for displacement. 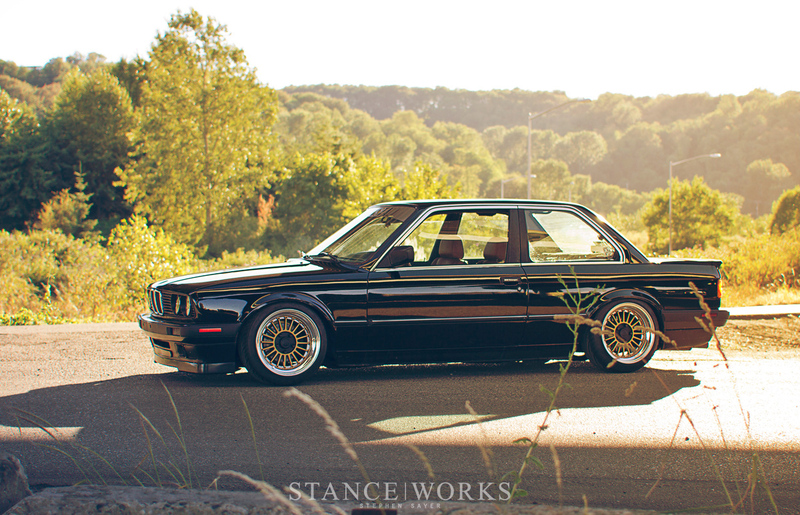 However, it may be some time before the V8-powered E30 comes to life, as Stephen's focus has shifted once again. "The 911 I’m really excited about. While the E30 has been a big transformation over several years, the 911 is the first 'tear down and rebuild everything at once' type build." 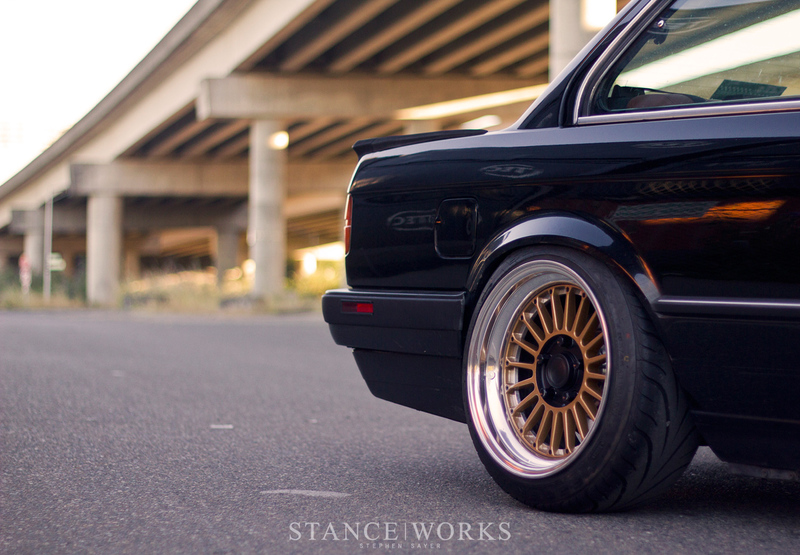 If his E30 serves to suggest anything, it's that the 911 will be just as pleasing to see. 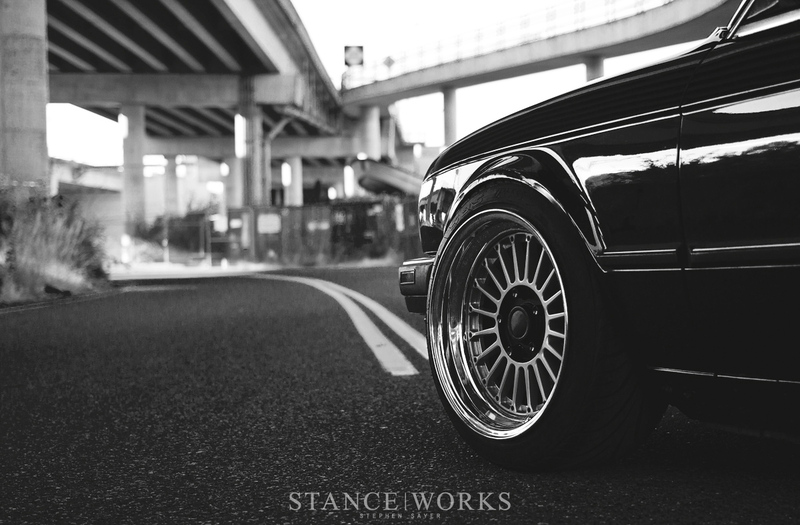 In due time, we hope to see both, side by side, on the pages of StanceWorks once again. I have a bonner bigger than mr. everest right now! How was the rear bumber tackled ? This is perfect !!! If you fix the chrome on the windshield and rear window, your car would be perfect! mavrikno137641 Rear, yes. Sides, no. It compliments the deep dishes nicely. Nice car. Shame about the gyno.